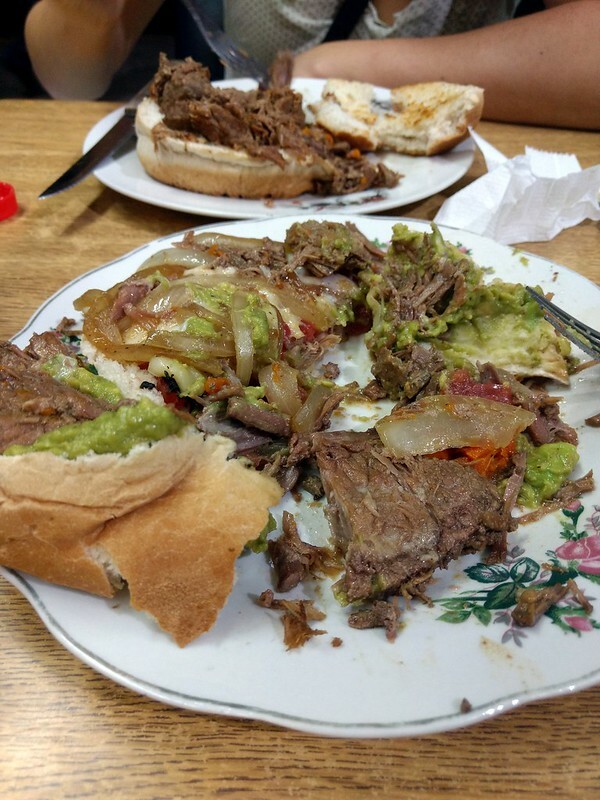 Here is THE MEAT of Chile, a heavy semi-shredded served up with fresh veggies and several spoonfuls of its own juice on a bun. Imagine making a hamburger but replace the ground meat patty with the most amazingly juicy pot roast you’ve ever had and you’ve got a good approximation. These are expensive by our standards; two of these sandwiches cost about $15 USD, but we’re coming from three months of spending less than $10 for the two of us on meals. When you’re an adult, you can play with your food all you want. Only people on the internet will judge you. 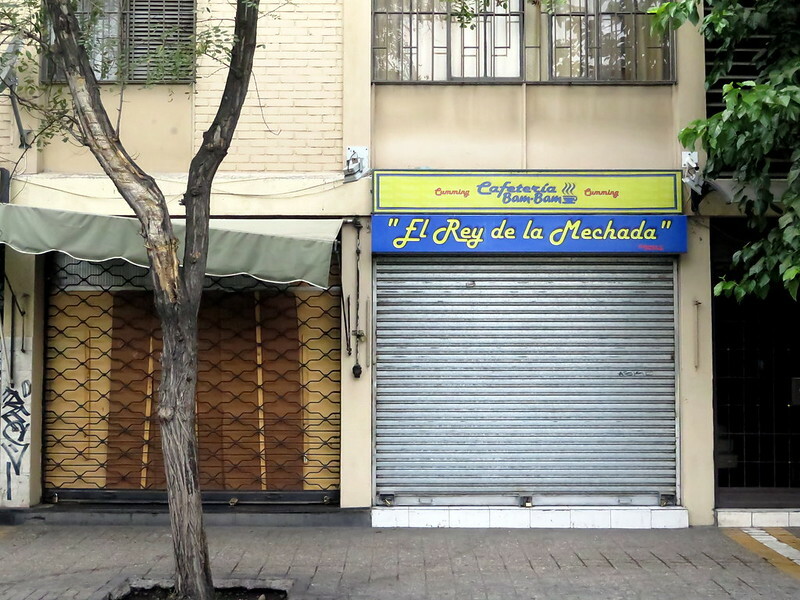 We went back the next day (our last day in Santiago) for breakfast, but alas! The king of Mechada (Cafeteria Bam Bam) is only open for lunch and dinner. Next time, Mechada. 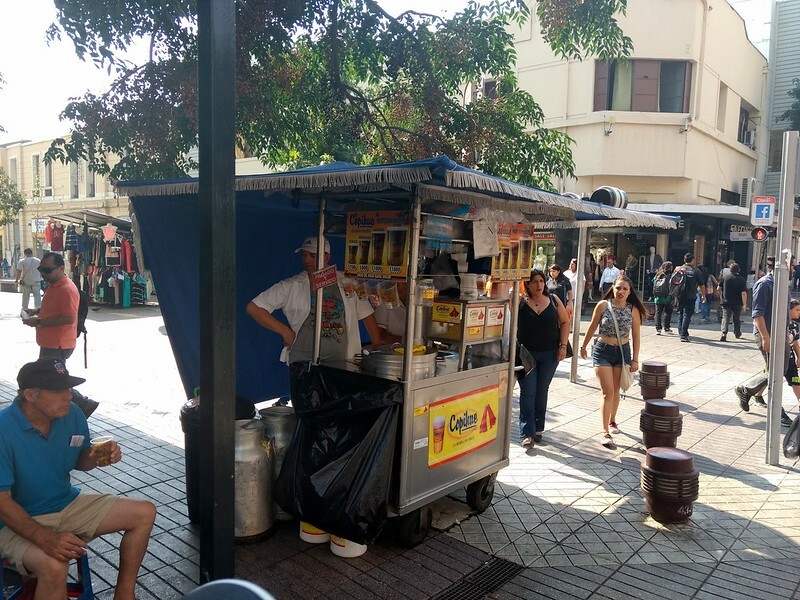 Craving your own carne mechada? I’ve found a recipe for you. 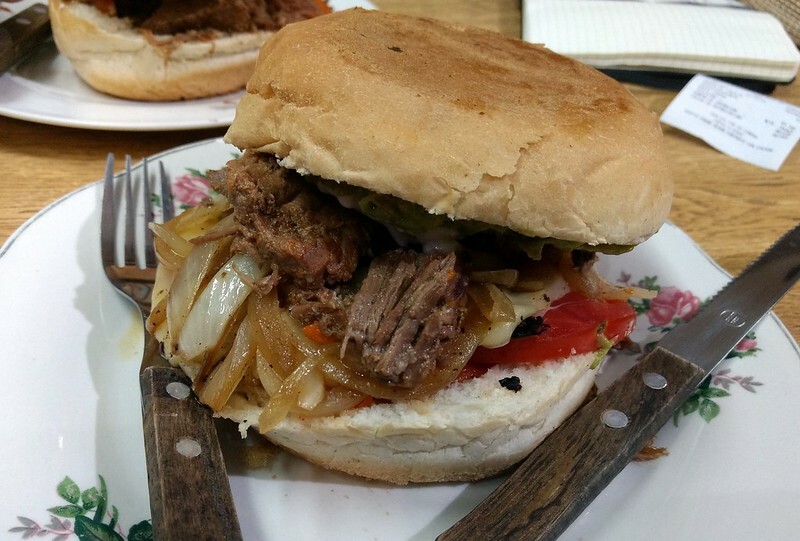 Note that it requires some rather involved “stabbing the meat and shoving vegetables in it”, but that’s apparently how you make the true Chilean version of this dish. 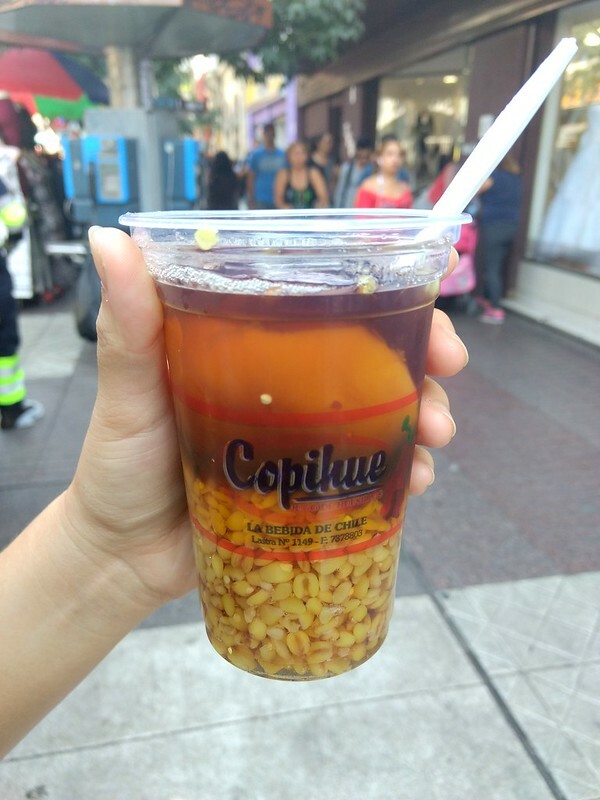 Fresh/homemade drinks are a big thing in South America, and here in Chile the made-to-order summer drink is Mote con huesillos. Sold by vendors on the street, the drink is a combination of mote (a local grain) and boiled dried peaches. I can’t think of any similar drinks in the U.S., although the combination of a sweet drink with chewy bits reminds me of boba and bubble tea. While re-constituting dried peaches for the drink might seem odd, the really strange part of this drink is the mote. There’s no English equivalent for the grain, though the vendors explained it to us as “triga”, or wheat. But in actuality, it’s wheat boiled with lye, then rinsed and dried for sale. I learned all of this from this super-interesting analysis of the drink that winds through Mesoamerican history, nutrition, public health, and cooking; you should read it too. Mote con huesillos vendors are out in force in the summer, and you probably won’t be able to walk a block without running into one. A mere USD $1.50 gets you a cup of the stuff, perfect for cutting the summer heat. Want to make your own mote con huesillos? Here’s a recipe to try (Spanish). For a recipe in English (and the aforementioned fascinating tidbits on American history, nutrition, and culinary tradition), visit this page.